Camp Directors (CDs) and Counselor Workers (CWs) are responsible for day-to-day camp management, campus upkeep, and the supervision of minors. CW positions include cabin, librarian, breakfast set-up, development, and driving CWs. CDs and CWs are enthusiastic about chamber music and Apple Hill’s mission. Eligibility: CWs are returning participants over the age of 21, with limited spots available for ages 18-20; CDs are returning participants over age 21 who have experience as a CW. Compensation: CDs and CWs receive a full scholarship for tuition, room, and board in exchange for their work. To Apply: A complete CW or CD application includes a completed online application form (please use the same form as other participants), a $75 application fee (waived for applications received by Dec. 18), and a new placement recording. Please make a note in the comments section of the application indicating your interest in a CW or CD position. Session Dates for CDs and CWs: CDs and CWs need to be at Apple Hill for the full duration of the dates listed below. Teaching Assistants (TAs) are responsible for working one-on-one with participants to help them prepare their individual parts for group coachings. TAs are enthusiastic about chamber music and Apple Hill’s mission. Eligibility: TAs are returning participants over the age of 21. 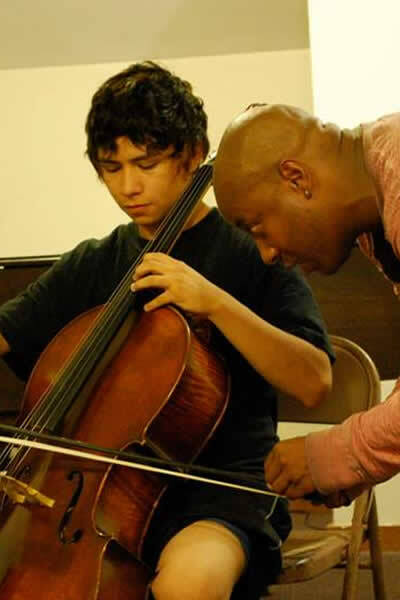 They are experienced and dedicated musicians and music teachers. Compensation: TAs receive a full scholarship for tuition, room, and board in exchange for their work. To Apply: A complete TA application includes a completed online application form (please use the same form as other participants), a $75 application fee (waived for applications received by Dec. 18), and a new placement recording. Please make a note in the comments section of the application indicating your interest in a TA position. Session Dates for TAs: TAs need to be at Apple Hill for the full duration of the dates listed below.